The Sinai MFO flag is a bright orange flag that flies at its two headquarters and in the observation posts and checkpoints along the peninsula. The Sinai area is considered a military zone. 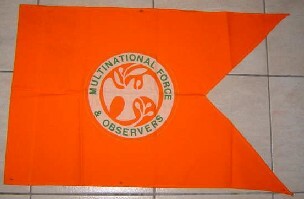 The flag is composed by a circle with the MFO words and logo in the center of an orange background. The logo is composed by well-known peace symbols: dove and olive branch in white but fimbriated in red. The Multinational Force & Observers (MFO) peacekeeping force supervises implementation of the security provisions of the Peace Treaty between the Governments of Egypt and Israel in the Sinai Desert and the Strait of Tiran and Gulf of Aqaba. The MFO logo is a white dove with a white olive branch, as a symbol of peace, on a circular logo with the words MULTINATIONAL FORCES & OBSERVERS, on orange and white background. Operation of checkpoints, reconnaissance patrols, and observation posts along the international boundary and Line B, and within Zone C.
Periodic verification of the implementation of the provisions of Annex I, to be carried out not less than twice a month unless otherwise agreed by the Parties. Additional verifications within 48 hours after the receipt of a request from either Party. Ensure the freedom of navigation through the Strait of Tiran. Source: Official MFO website http://www.mfo.org/site_tree/4/28/base.asp. The two stars indicate the rank of Major-General. The swallowtail version of the above flag: reduced from a photo found on Marktplaats, Dutch auction site, offer no. 5823929313, accessed 30 Oct 2006, put up by "HJB". Dimensions given as 51 cm x 80 cm. "A special variation is used during the nighttime and on vehicles by the MFO. The "standard" is a swallowtailed version of the MFO flag; it is 20" x 27 ¾" (50 x 70 cm.) and flown only at night. Half its size is the "vehicle standard", of the same shape and design, to be displayed on specified MFO vehicles operating in the Treaty Area." This standard is shown in b/w on p. 89 but the emblem is much larger, in fact taking up most of the area (tails not included). Given the size of the Marktplaats item this must be the nighttime variation not used on vehicles. A rank flag (fringed orange, by the way) may be seen on this Wikipedia page: http://en.wikipedia.org/wiki/Multinational_Force_and_Observers. Caption (quoted): "The Force Commander's Flag. The Commanding General of the Multinational Force is authorized to fly a flag with two stars (symbolizing the FC's rank) and the MFO symbol." More, but not much, on the MFO rank stars. Smith’s 1982 article (p. 90) shows in b/w the flag of the MFO Director General (civilian) flying a rank flag similar to the one shown on the Wikipedia page, only there is a star in each corner. According to the author (p. 91) this flag is "4’4" x 5’6" (130 x 165 cm.) and has a 21/2" (6 cm.) orange fringe on three outer sides"; there is one in the DG’s office and a smaller one on this automobile (used with the standard mentioned previously). The Commander (Smith p. 92) flies a similar flag with one star (my emphasis) "centered between the emblem and the fly edge of the flag". Dimensions: 3’ x 4’ (91.4 x 122 cm. ), orange fringe on three sides, office and vehicle use (standard not mentioned). I hope someone will be able to come up with an explanation (evolution? or higher rank of present commander?) of the difference in number as there is after all photo showing two stars in the hoist. Note: on the warship photo mentioned previously two men are busy with a jack but details are not clear.